If you’re looking for Soccer TV schedules, we have the most comprehensive and up-to-date listings of where to find your favorite soccer teams. We’ve organized the TV schedules into the different leagues and competitions, so you can scroll through each one for the most accurate and frequently updated listings. Note that TV schedules are subject to last minute programming changes, so be sure to check the schedule before making your plans to watch the big game. In addition to the TV schedules below, we offer a free daily e-mail newsletter that includes the latest soccer news and TV schedules. On the TV schedules for each of the popular soccer leagues listed below, we also include the cup competitions that those league teams play in in addition to games featuring the national teams of those countries. World Soccer Talk is a treasure trove of helpful information for new and old soccer fans alike. 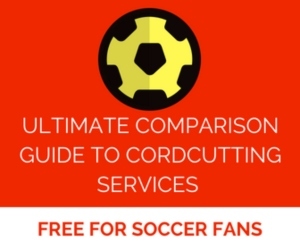 We’ve created comparison guides of the popular soccer streaming services as well as DirecTV vs. DISH for satellite TV (US only). And much more. If you have any questions about soccer TV schedules, just let us know in the comments section below. Hi Daniel, all of the commentators for FOX’s Europa League coverage are calling the game off TV monitors in Los Angeles. Hi Christopher would you know if there is any way to tune into the radio broadcast of Sky Sports Saturday. It was working last season but I can not find it anymore. Not that I’m aware of, sorry! Hi Jason, hopefully Sunderland won’t get relegated but if they do, some of Sunderland’s matches will be on beIN SPORTS and beIN SPORTS Connect via fuboTV. During an average week, beIN SPORTS broadcasts 2 to 3 Championship games per weekend — 4 if you’re lucky. So you won’t be able to watch all of their games, but hopefully they’ll be on every few weeks. This could change next season (fewer or more games — who knows), but if things stay the same, the above is what it’s like now. Hi Mark, the game won’t be shown legally on US TV or streaming as of press time. If something changes, I’ll update this comment. Your best bet may be to listen to a radio broadcast of the game. And if it’s blocked, you can unblock it via a VPN free trial (more info at http://www.worldsoccertalk.com/vpn-soccer). Nothing legally, sorry Tom. It’s on Sky Sports 1 in the UK. any streams,available to watch in Canada, of soccer aid today June 5? Any idea if Mourinho’s first game on Saturday at Wigan will be live on tv / streamable in the USA? Right now, the only place it’s being televised is on MUTV, but that channel isn’t available in the States. If I hear anything about it, I’ll add it to the Premier League TV Schedule at http://www.worldsoccertalk.com/premier-league-tv-schedule page. Do you know what happened to match of the day or the premier league review show in the US? Checked my listings, no results show up for match of the day…Is there a new extended highlights program on NBC sports? The Olympics is getting in the way. Once the Olympics end on Sunday, we believe everything will return to normal. Purdman, I got the same shock a moment ago when I realized I wasn’t gonna get the Chelsea vs West Ham game today as they’re showing Olympics instead. CH – thanks for shedding light on this. Another downside to Sling is that it seems you can’t time-shift the matches, they don’t store the games and you can’t “record” them. Wow. So on Pacific time you either get up at 4am for the first match or you’re screwed. The also had Prem club preview shows in the middle of the night — again no way to time-shift, so missed them. Also, as you said, I really hope they have a MOTD or a highlights program. I’m sticking with Sling but it’s a makeshift answer the way it currently is. Good aspects: great picture quality, minimal buffering/blank-out, easy to fire up the program/app on my Mac. But for us long-time cable cutters we’re still not being catered to at a suitably professional level, even tho’ the cat is out of the bag so they are ultimately hurting themselves the most [just like the recording industry pretty much went the way of the Dodo because of short term greed and lack of dynamism and vision]. It is wonderful to find a large collection of upcoming soccer broadcasts. I would appreciate seeing a similar listing of the upcoming CONACAF hex games. All I found were from last round. Will the Copa Centroamericana be televised anywhere in the US? Yes, the games will be shown on Univision Deportes and fuboTV. Hi! Do you have the broadcast schedule for Copa Libertadores 2017? Thank you! Not yet. We’re waiting on the teams to be finalized for Week 1 of the tournament, but we do plan on publishing a schedule soon. Thank you Christopher! 😊 Awesome work! Is the US Women U23 games being played in La Manga Spain the first week of March-2017 be available to be seen? Not that I’m aware of, sorry. I am trying to find where I can stream the Newcastle-Barnsley match for Sunday 7 May 2017 in the United States. All links I find are not planning on showing it. Appreciate any assistance. how about a U21 Euro schedule? You can find those games on ESPN Deportes and ESPN3. The http://www.espn3.com website will have a schedule for those matches. Belgian League US TV Schedule? Belgium’s First Division A is not shown on TV or streaming in the United States. I’m in Canada, and trying to find live TV coverage of the upcoming Spanish Super Cup games on August 13 and 16. The regular TV channel of BeIN Sport (which I have) doesn’t seem to be offering these games (at least not in their Canadian programming). Even Fubo TV doesn’t appear to be showing them. Rights to SuperCopa de Espana and the Copa del Rey final are marketed by Santa Monica Sports on behalf of the RFEF. Those rights are not part of the La Liga and Copa del Rey except final package sold to beIN by MEDIAPRO. ESPN has rights to the SuperCopa/Copa del Rey Final in the US, but not Canada. Those rights are relatively expensive. Any word on why the half dozen Copa Del Rey matches originally scheduled to be shown on beIN next Tuesday through Thursday have now been removed. Evan, no word from beIN SPORTS why the games have been removed from their programming guide. Hopefully the issue will be resolved soon so the games can return to beIN. You missed Leeds United vs Port Vale in the EFL Cup on ESPN3 on August 9. Have you guys seen this service that seems to be streaming some south american soccer? Took over for NGSN? When are you planning on going? I’ve come to your site because SoccerAmerica started charging for the same info. What I liked about them was that they emailed you daily with all the games in a 5 day span all in one email. 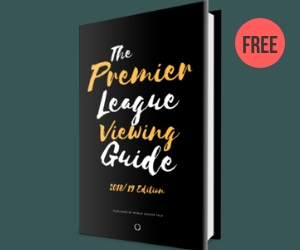 I prefer premiere league but like to see all the leagues and what’s available in case there’s a match I may have missed by o my seeing one league listing. Do you guys over a comprehensive email of all televised games on a given day from all leagues? Do your newsletter contain spoilers? I almost never get to see games live and avoid Soccer news. I only want an email will all games from all leagues and which channel and time they’ll be on so I can set my DVR for the games I like and also avoid scores and spoilers. Thanks for all you’re doing. Hi Toby, the email newsletter does contain spoilers. In that case, your best bet is to bookmark the TV schedules page at http://worldsoccertalk.com/tv-schedule/ and then click on any of them. They’re updated daily (usually). Will Univision air Liguilla on the free Univision during the weekday? Or Unimas, galavision? Hi Paul, we only focus on US TV listings, but I’m not aware of any sites that include listings for Colombia, sorry. Is there anywhere a single consolidated calendar for all professional soccer (top level and lower leagues, too)? So in planning a trip to Europe, I could see all the games in every league that are played on Aug 17? and then 18th, etc, etc. There used to be such a schedule published on a website called soccernet.com, but ESPN bought it and now only shows schedule by league. I’m not aware of one that exists, but the closest thing I can think of is to go through the calendar day-by-day at soccerway.com and that should give you what you need.